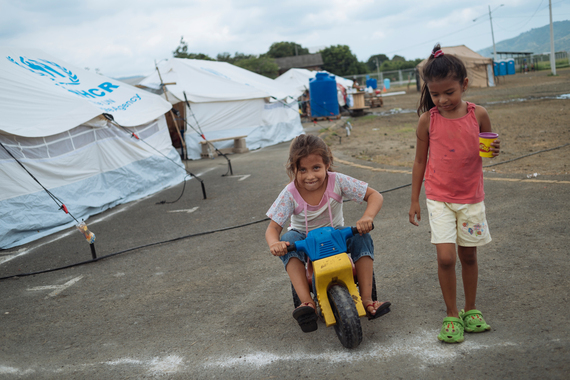 The sad reality, however, is that millions of children around the world are deprived of play due to war or natural disaster. 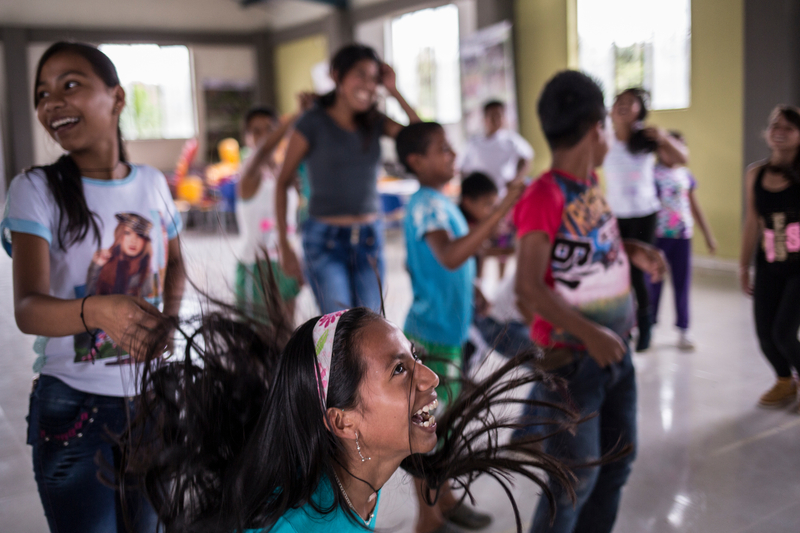 On World Play Day, we want you to meet ten children who may have been left with little, but still have the courage to keep playing. Play is fundamental to healthy child development. It helps children do well in school. It develops their creativity and imagination. It teaches them how to solve problems and to build relationships. And, bottom line, it's pure fun. 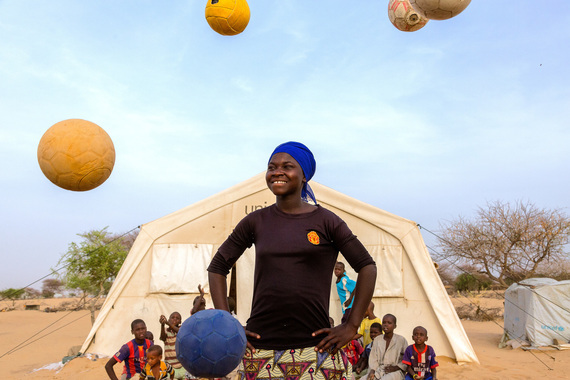 Hanatu Musa, 13, comes and plays soccer every afternoon at the UNICEF Child Friendly Space in the Dar es Salam refugee camp in Chad. Across Nigeria, Niger, Cameroon and Chad, more than 2.3 million people -- mostly women and children -- have now fled violence prompted by Boko Haram. "My teacher back in Nigeria told me that it is very important to exercise. He said that one can achieve anything in life if one exercises," says Hanatu. "When I play soccer I feel much better and when I see people playing, I always feel tempted to jump in and be part of the game." Solanyi Vanesa Ortiz, 13, plays with her friends at a UNICEF peacebuilding workshop in Nariño, Colombia. Solanyi's parents were both killed by armed groups in separate incidents, and her grandmother disappeared a few years earlier. Solanyi is an Awá, a member of an indigenous community living in the jungle in western Colombia on the border with Ecuador that subsists mostly on hunting and fishing. As the conflict that has battered Colombia for years drew closer to their homes, the Awá became easy prey for armed groups. Nearly 45,000 children have been killed, 2.3 million have been displaced, and 8,000 disappeared since 1985. 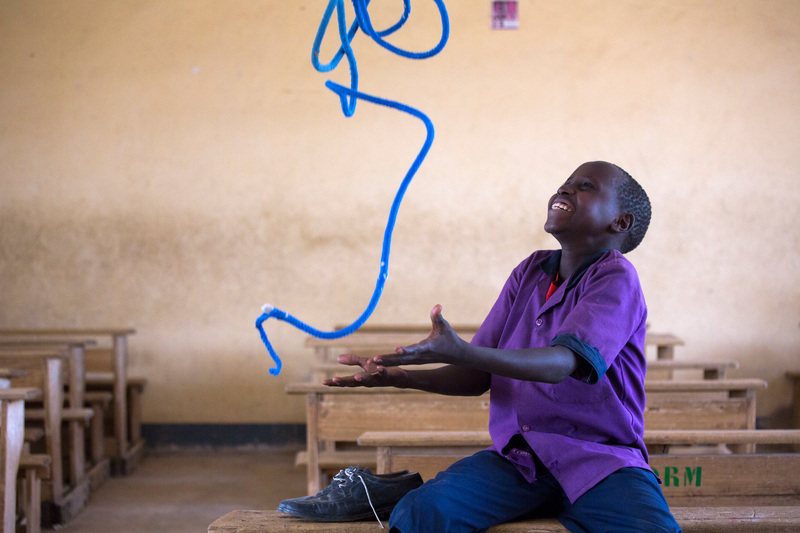 Today, Solanyi dreams of becoming a teacher, or a ballerina, or both. Shazi (right), 10, and Huzaita, 10, jump rope at the reception centre for refugees and migrants in Idomeni, located on Greece's border with the former Yugoslav Republic of Macedonia. 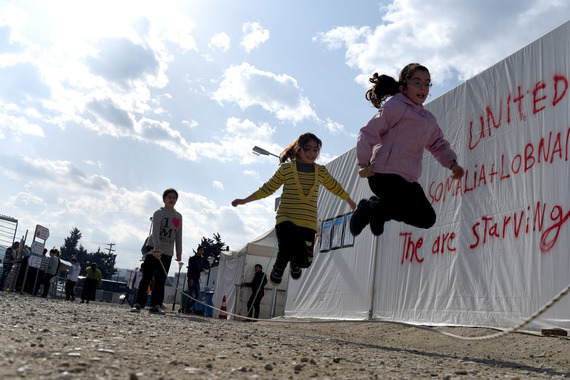 Both from Syria, the two young girls fled their home country as conflict spread. More than 8.4 million Syrian children are now affected by the conflict, either inside the country or as refugees in neighbouring countries. Shazi and Huzaita take advantage of UNICEF's Child and Family Support Hub, which provide a safe space for children and their families, vital services, play, protection and counselling all in one place. 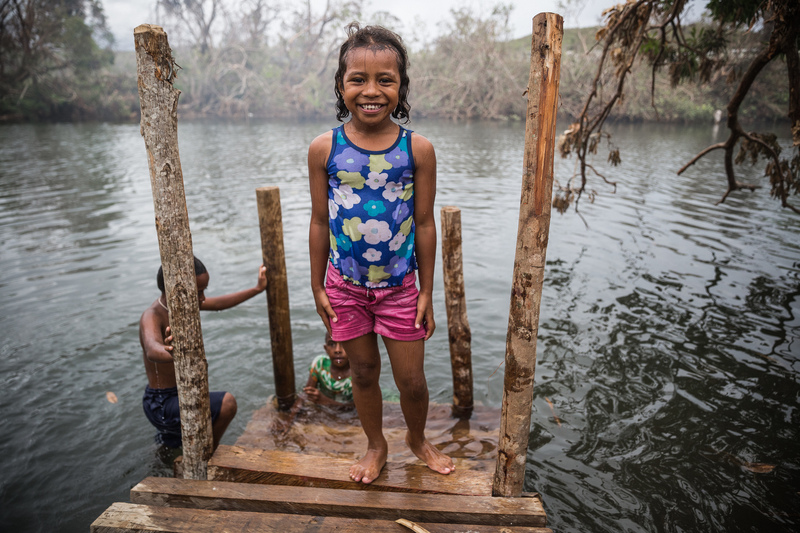 Grace, seven, and her friends play on a wooden staircase that goes directly into the river. Grace's home village of Lawaki in Fiji was devastated by Cyclone Winston, one of the most powerful storms in the country's history. 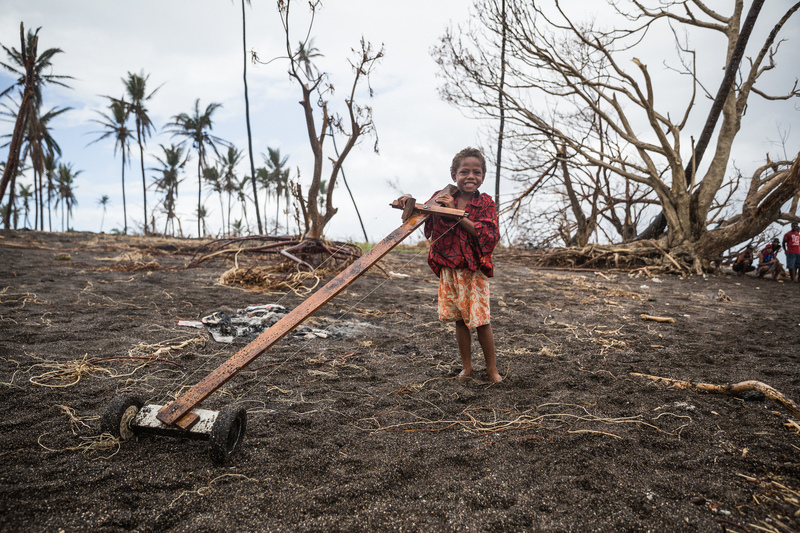 "After the cyclone, we couldn't play in the river, because all the rubbish was floating, pieces of tin roof, people's things, fallen trees," said Grace. "For two days we didn't have water to drink, so we were drinking rain water from the pieces of tin rooves." In partnership with the Government of Fiji, UNICEF worked to assist 30,000 people affected by Cyclone Winston through by providing safe drinking water, hygiene and sanitation supplies. When Boko Haram attacked his village and killed his parents, David, 12, hid in a dry river bed to escape. He has not seen his younger brother since the attacks, and doesn't know if he's alive or dead. The conflict in northeastern Nigeria prompted by Boko Haram has led to widespread displacement, violations of international humanitarian and human rights law, protection risks and a severe humanitarian crisis. Today, David finds time to play in between classes at the Baigai government school supported by UNICEF in northern Cameroon. Ana Francesca Cede-o Sanchez rides her toy bike with a friend amongst the tents at a shelter in Portoviejo, Ecuador. She is one of the more than 720,000 people who were affected by the earthquake that struck Ecuador on April 16. Ana's house, along with thousands of others, were destroyed, food and water remain scarce, and aftershocks and heavy rainfall are exacerbating the damage. UNICEF is supporting the government through the provision of emergency supplies for health, education, and water, sanitation and hygiene. Tevita, nine, plays with his homemade 'car' toy on Taveuni Island in Fiji. The southern part of Taveuni is among the worst affected by Cyclone Winston. Some villages were completely destroyed and people were left without food for almost a week as access to the island was cut off. After the runway and roads were cleared, UNICEF assisted in providing emergency support, but many people are still in shock after losing everything. 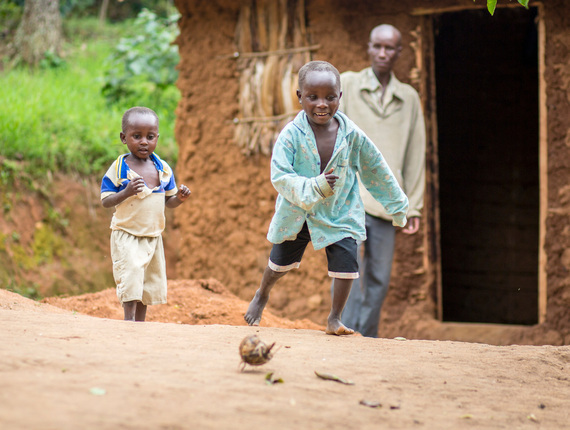 Eric Butetera (right), eight, and his younger brother Dalton, five, play a game of football with a ball made of banana leaves at their home in Kisabo Village in the Ibanda District of Uganda. Their father Geresoumu looks on. He is happy to see his sons playing again. Both were severely malnourished when a community health worker visited their home three years ago. After the intervention by a volunteer health team, and the implementation of a UNICEF-supported nutrition program, Eric and Dalton both made full recoveries.